PXI Digital Multimeter / Digitizer Card - GX2065 | Marvin Test Solutions, Inc. The GX2065 offers a unique combination of features, resolution, accuracy and speed in a compact, single slot 3U PXI format. Featuring 6-½ digit resolution, 0.005% basic DCV reading accuracy and up to 3,500 reading per second (rps) assures you of measurements that are accurate, fast and repeatable. All measurement functions including digitizing functions are isolated from the PXI bus - providing the ability to make true differential, floating measurements. An on-board controller performs all necessary DMM and digitizer calculations, minimizing PXI control bus overhead. 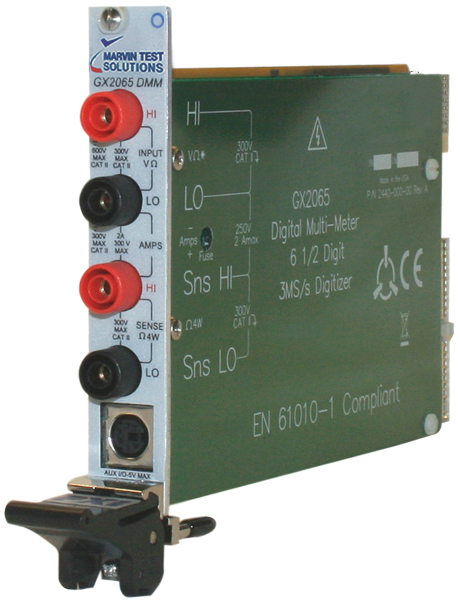 The GX2065 is designed as a universal, multifunction DMM and provides all of the features associated with standard bench top DMMs including VDC, VAC, 2 and 4 - wire resistance measurements, and current measurements. Additionally, the GX2065 features a 3 MHz, 16 bit, isolated input digitizer which allows users to acquire and analyze waveforms. Built in analysis and waveform functions include RMS, average, peak to peak, and peak to average measurements. Up to 8192 samples can be stored in the digitizer’s memory. Frequency and period measurements to 500 kHz are also supported. An external TTL trigger via the PXI bus or front panel is available for triggering DMM measurements. The GX2065 is supplied with the GXDMM software package which includes a virtual instrument panel, a Windows 32/64-bit DLL driver libraries and documentation. The virtual panel can be used to interactively program and control the instrument from a window that displays the instrument’s current settings and status. In addition, interface files are provided to support access to programming tools and languages such as ATEasy, LabView, LabView/Real-Time, C/C++, Microsoft Visual Basic®, Delphi, and Pascal. An On-Line help file and PDF User's Guide provides documentation that includes instructions for installing, using and programming the board. Signametrics SMX2040 & SMX2060 compatible drivers are also supplied, allowing customers to easily upgrade existing applications to the GX2065. Crest Factor (VAC) No limitation as long as maximum input signal is below the maximum range value. * Input amplitude must be at least 20% of FS and input amplitude must not exceed specified volt - hertz product. Calibration Calibration is performed at the factory using NIST traceable instrumentation. All calibration constants are stored on-board in non-volatile EEROM. Calibration can be performed by any calibration laboratory with the appropriate equipment.